PokerStars recently released a short documentary film featuring one of their most famous and successful members of team online – Nanonoko. If you are a part of the online poker community, chances are you’ve heard of this grind machine. 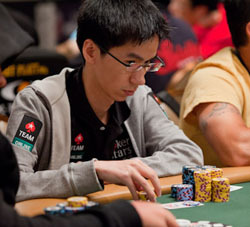 Nanonoko has made PokerStars Elite a total of 4 times, has played nearly 5 million hands, and has won over $2.5 million. Yes, it is easy to say that he knows what he is doing. This short documentary is interesting because it takes you into the personal life of Nanonoko. IRL he is known as Randy Lew, and the film shows some of his personal interests and how he got started playing poker. Like most professionals, he started playing small casual games with his friends for fun. However, unlike the other players at his home game, he turned it into a multi-million dollar hobby. So without further ado, below you can watch the documentary of one of the most successful online poker grinders in history – I AM NANONOKO. It is a very interesting look into the life of a member of PokerStars Team Online!